While M.2 drives are nothing new to the PC community, many manufacturers like Samsung have been holding off on developing drives for the retail market until more devices were able to utilize them. We have finally reached the point where a large enough portion of new motherboards and laptops include M.2 slots that Samsung is ready to release their first retail M.2 drive: the Samsung 950 Pro. It's unfortunate to say but after reviewing several generations of Samsung SSDs going as far back as the 470 Series in 2010, TechSpot was left out in the cold by Samsung for the SSD 950 Pro launch. Having in the past year looked at the well-regarded SSD 850 range, and unlike most other outlets, gone as far as testing and reviewing the enterprise-bound SM951 PCIe SSD, the radio silence for this latest launch caught us by surprise. Ultimately manufacturers are not obliged to send every publication a review sample, though in our case we had built a strong relationship for many years. We hope this has nothing to do with our report on the faulty SSD 840 support. We realize Samsung SSDs are among the best (if not the best) and we will be reviewing them regardless, though it might take a while longer if we have to buy them from retail channels which means the first reviews will have gone live by then. In the meantime, we bring you some insights from our friends at Puget who tested the drive recently and have found it to be close -- but not identical -- in performance to the SM951, in addition to gathering some interesting findings on the thermals with these new M.2 drives. This article was originally published on the Puget blog, written by Matt Bach, head of Puget Labs. The question is: how does the new retail Samsung 950 Pro compare to its predecessor - the OEM Samsung SM951? The SM951 has incredible performance (advertised at 2150MB/s read and 1550MB/s write), but we found in our recent review that it would reach temperatures as high as 110C. In this article we will look at the Samsung 950 Pro to see how it compares to the SM951 in terms of both performance and temperature. Physically, the 950 Pro is identical to the SM951. It uses the same M.2 M-key connector, is exactly the same size (22mm x 80mm) and requires a PCI-E 3.0 x4 M.2 slot in order to run at full speed. In fact, the biggest physical difference is one that is not listed in the specs: the 950 Pro only has chips on the top side of the PCB whereas the SM951 has chips on both sides. This is due to the fact that the 950 Pro uses the new V-NAND technology which allows the storage memory to be stacked to up to 48 layers resulting in a much denser storage medium. 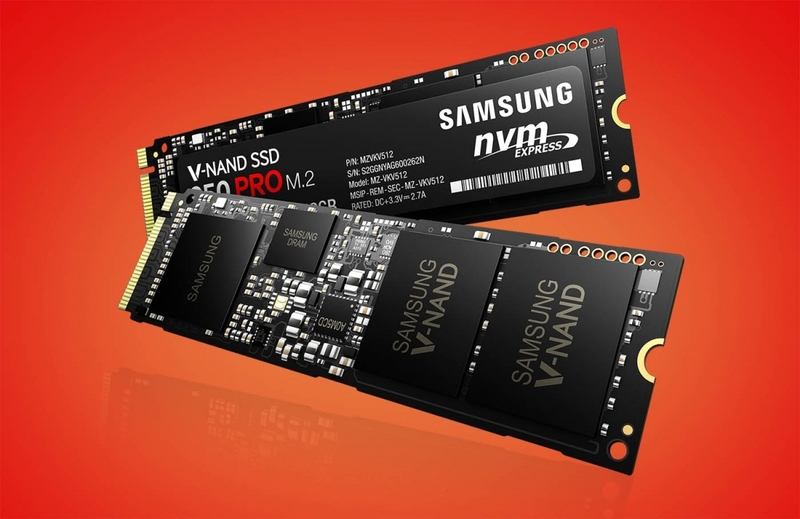 In addition to decreasing the amount of footprint you need for the storage chips, V-NAND is also supposed to be twice as fast as NAND, use only 45% the amount of power, and greatly improve endurance. Because of the move to V-NAND, the 950 Pro should have a higher maximum sequential read performance than the SM951 by about 250 MB/s. However, the rest of the advertised performance specs are fairly comparable. One of the more interesting specs for us is actually the endurance rating of the 950 Pro. Where the SM951 was only rated for 150 TBW, the 950 Pro is rated for 400 TBW (Terabytes Written) which is a much bigger jump than we would have expected. This still isn't anywhere near the endurance of a server-grade drive like the Intel DC P3700 series which has an endurance of 7,300 TBW - but it is one of the highest endurance rating we have seen for a consumer drive. The 950 Pro is currently priced much lower than the SM951 (about $0.68 per GB versus $0.91) and is also cheaper than the Intel 750 400GB even though it is 112GB larger. However, as we will show later in this article this drive can run fairly hot so if you want full performance over heavy sustained load you will likely want to use a PCI-E adapter with heatsink. If you use one of those adapters, the effective cost of this drive to be closer to $0.78 per GB. Even with an adapter, however, the Samsung 950 Pro is only about twice the cost of a standard SATA SSD. And considering the fact that you would need to RAID four or more SATA SSDs in order to get the same performance of the 950 Pro the price is actually extremely attractive if you need a high performance drive. The last thing we wanted to mention is that while the 950 Pro should work as a secondary storage drive on almost any motherboard, you will need a motherboard with newer chipsets (like Z170, Z97, X99, C602, etc) if you want to install an OS onto it. Even then, you will need to install in UEFI mode as BIOS mode is not supported. This benchmark was actually just recently updated to improve the accuracy of the results when benchmarking NVMe drives so it is even more accurate for these ultra fast drives than it was in the past. The SM951, on the other hand, sustained the 700-800 MB/s transfer speed except for around the 150, 190, and 230 second mark where you can see a slight dip in temperature. At each of those points the controller on the SM951 hit 111 ºC for a split second and the paused the file transfer until the temperature dropped to below 100 ºC. Even considering the areas where the Samsung 950 Pro isn't breaking marks, the current price points of only about $350 for the 512GB version and $200 for the 256GB version are extremely attractive. Yes, that is about twice the price of the SATA-based 850 Pro drives from Samsung, but in exchange you get up to 4x the read performance and 3x the write performance! The biggest issue we have with the 950 Pro is one that seems to come up often with high performance NVME drives -- temperature. The 950 Pro does run cooler than older NVME drives, but the controller still easily hits 98 °C at which point the drive throttles. We were hoping that the move to V-NAND would improve the controller temperature, but it appears that this is not the case. All this really means is that if you want to be able to maintain the full speed this drive is possible of at all times you will need to use a M.2 to PCI-E adapter with a heatsink. On the other hand, Samsung publicly advertises the throttling capability of this drive so if you are willing to see some performance throttling it should be completely safe to use it without a heatsink if you wish.